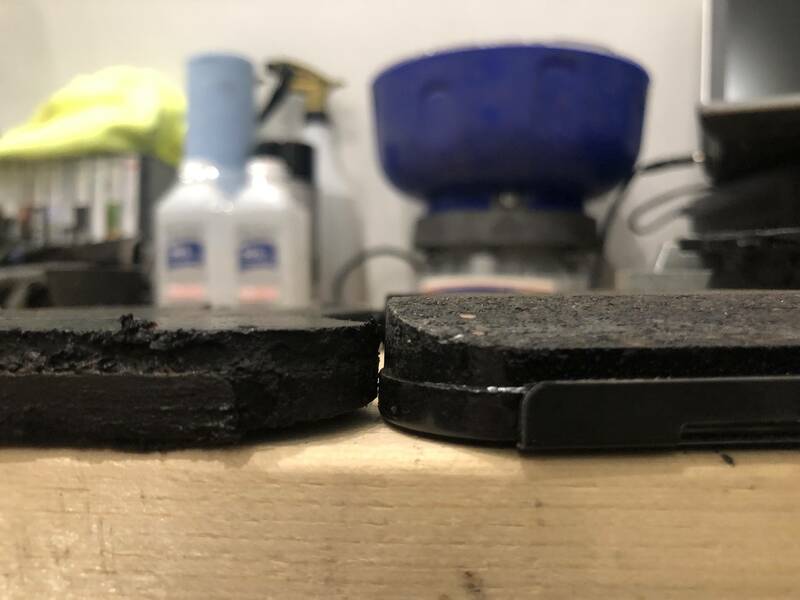 When the brake pad wear indicator comes on in the car, there is still 40% of the pad left (see picture). Mine came on at 59,000 miles. The rear calipers do not require the special caliper tool which rotates the piston in order to compress it. 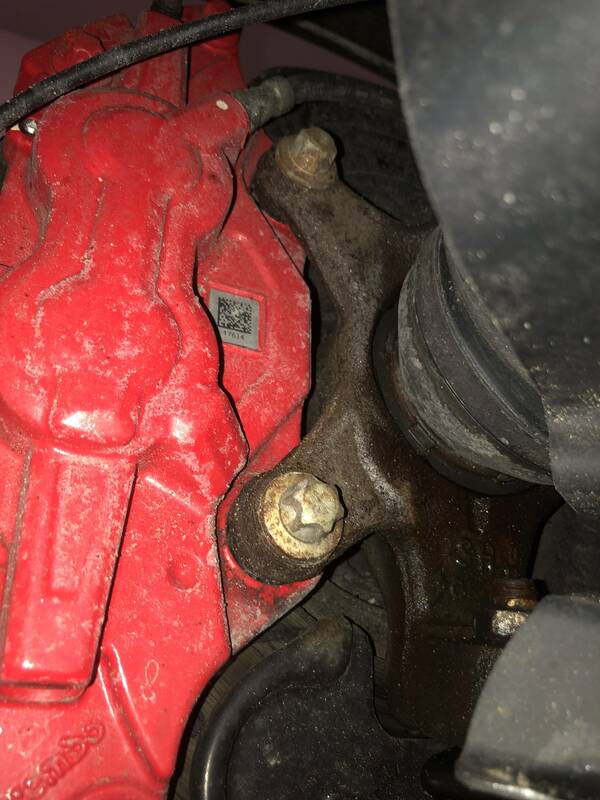 Because the car has an electronic parking brake, there is no need for a ratcheting/rotating piston like there is on most other cars that have mechanical parking brake. 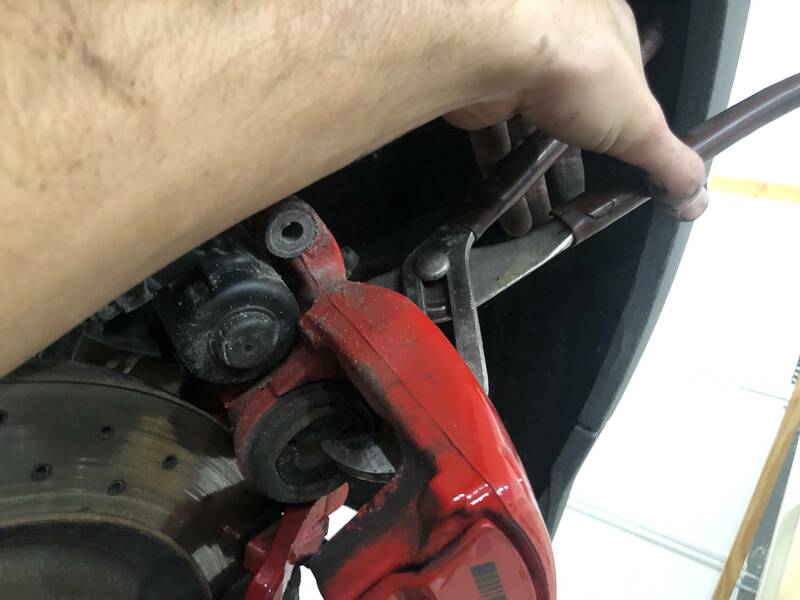 The rear rotors can be changed WITHOUT removing the caliper carrier. 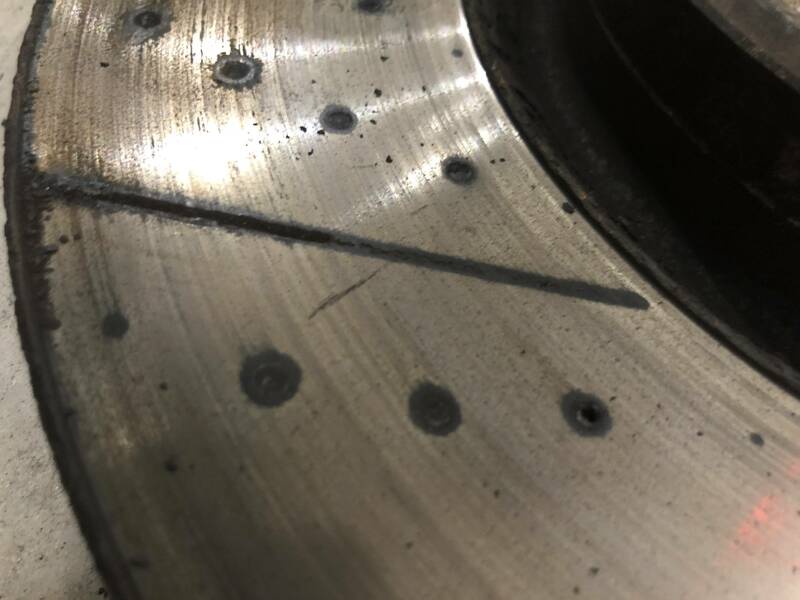 I am 100% certain that the OEM front brake pads and calipers are manufactured by Brembo because both had stamp/casting marks. I am 98% certain that the OEM rotors are also Brembo. I bought Brembo rotors for less than 1/2 the cost of rotors from the dealer and from what I can tell they are identical to the OEM ones. The only thing I am not sure about is whether they use a different coating from Brembo's "Green" UV coating. 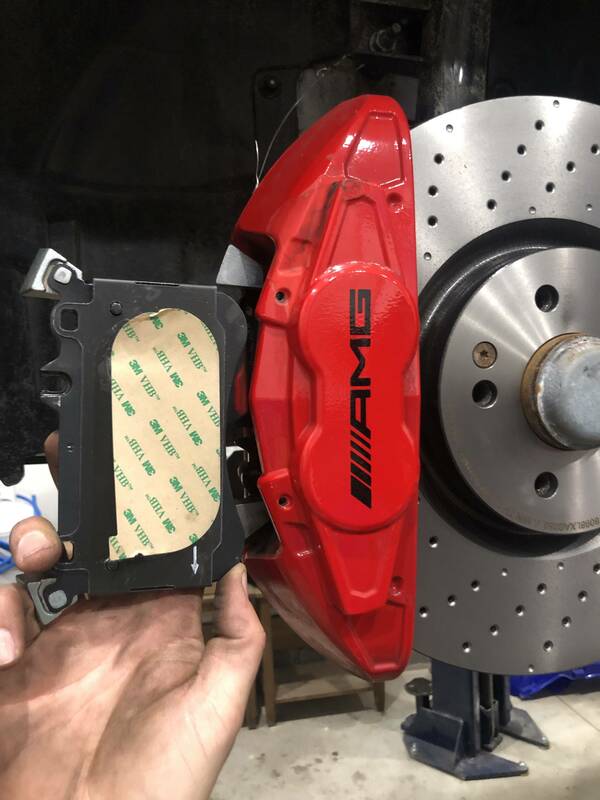 Time will tell how well the Brembo coating holds up. 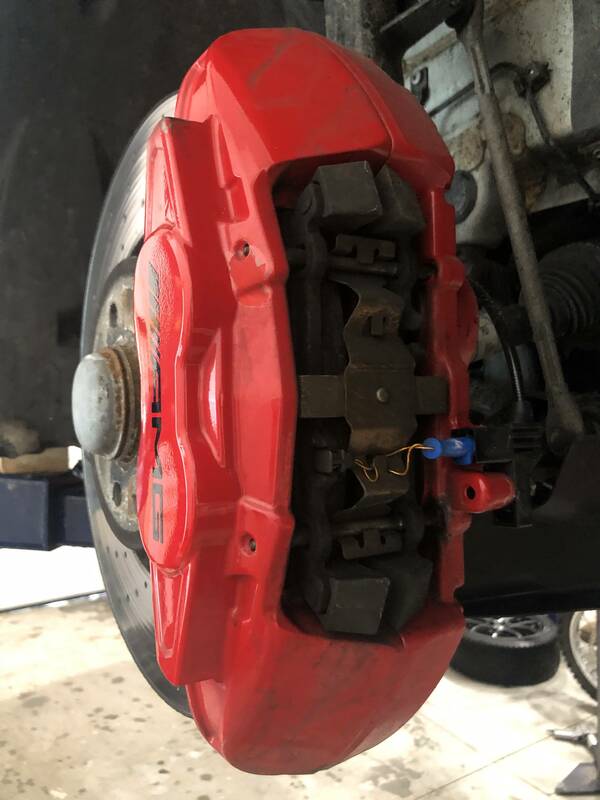 Access the Brake Service Menu to release the pressure in the rear calipers. When you are finished installing the rear brakes, you have to use this same menu to exit the fitting position. The slide pins have a 17mm nut, but there is not enough space for a normal thickness box wrench. 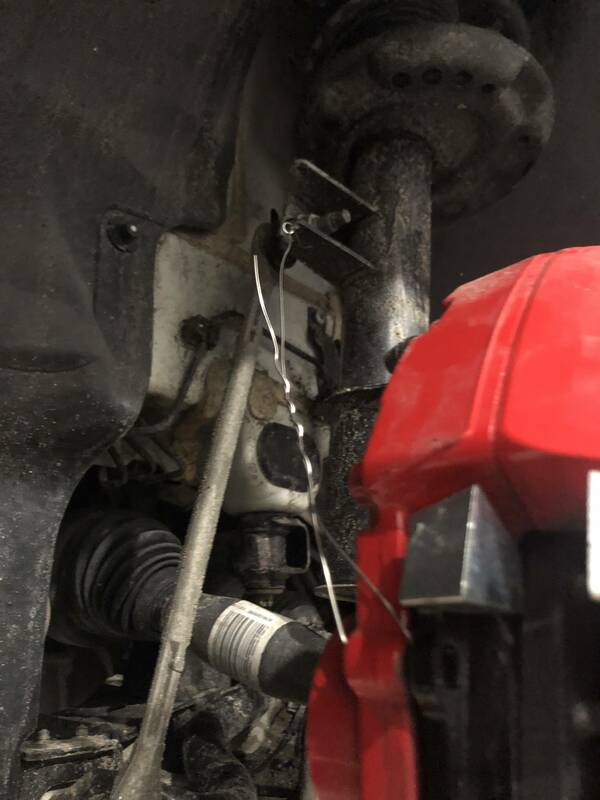 To get around this, I used a flat screw driver and wedged it against the bolt - by prying down I could achieve enough friction to hold the pin still while I loosened the bolt. An air ratchet makes doing it this way much easier. After the slide pins are out, use your pry bar to pry between the caliper and the carrier to remove the caliper. 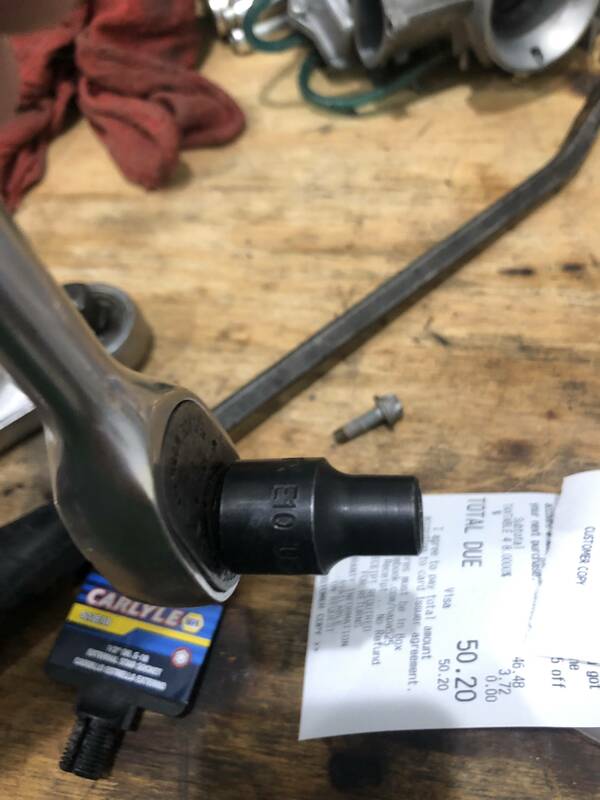 Use channel locks to squeeze the piston back into the caliper. 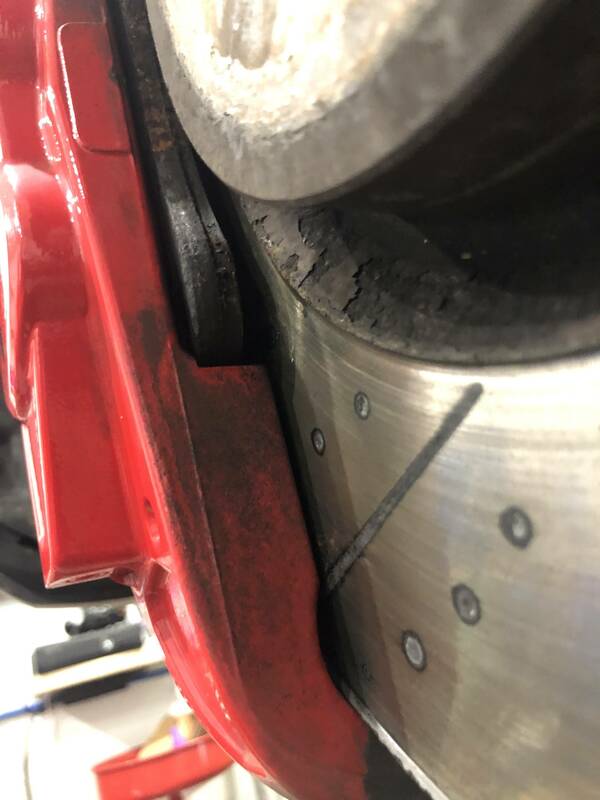 DONT PRY/SQUEEZE ON THE PASTIC part of the caliper. The passenger side has the wear sensor - use the E10 bit to remove the sensor holder. Unplug the old sensor and move the wire out of the way so it doesn't get damaged. Using a drift pin and your hammer, carefully drive the two brake pad retaining pins out. The push from the outside toward the inside. Once both pins are out, the spring clip will be free - save the pins and spring for re-installation. Wedge a small pry bar or flat screwdriver in between the brake pad and the rotor, then pry in order to push the pistons back into the caliper. Using the E18 bit, remove the two bolts holding the caliper to the steering knuckle. With the caliper removed, you can now remove the torx screw holding the brake rotor to the hub. My new rotors came with allen drive screws - which are awful to deal with once they are rusted. I re-used my torx screws since torx is less likely to strip. CLEAN all the rust off of the hub. 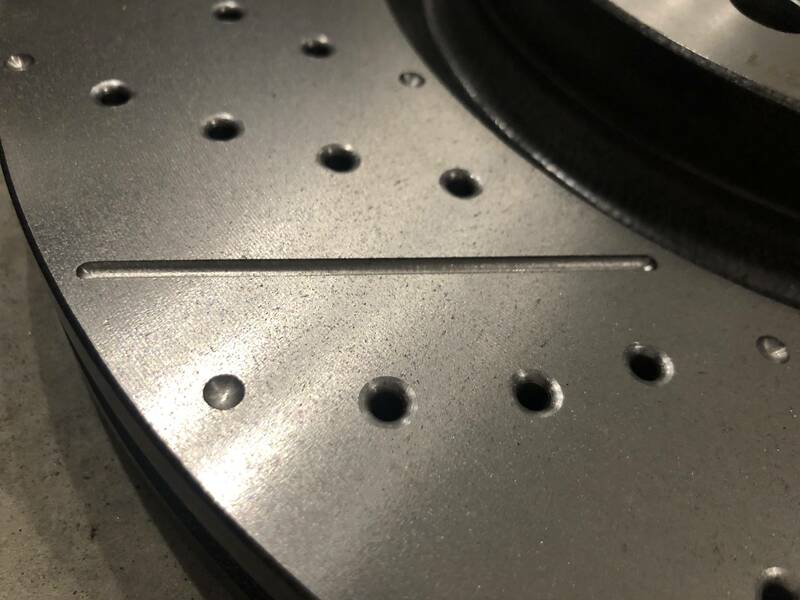 Due to the size of the rotors, even a tiny bit of rust will cause a runout on the rotor which will make the brake pedal throb like crazy. Bolt the caliper back to the steering knuckle. I don't have the torque specs - but tight is good and loose is NFG. Re-install the retaining pins - use a small hammer to tap them in. The spring will put tension on the second pin, I had to use my screw driver the push down & in on the pin as I tapped it into place. Can I ask where you got your Brembo rotors and pagid pads? And how much you paid? 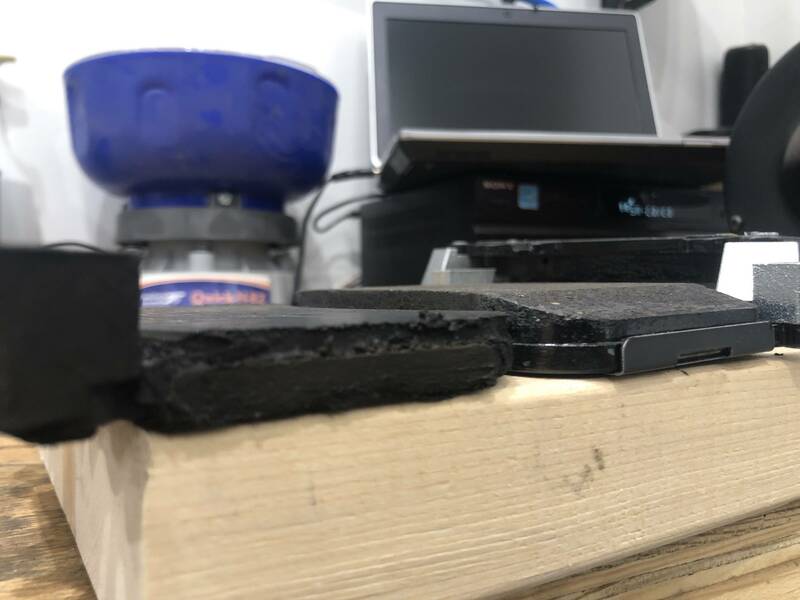 Any insights into using ceramic pads for less dust? 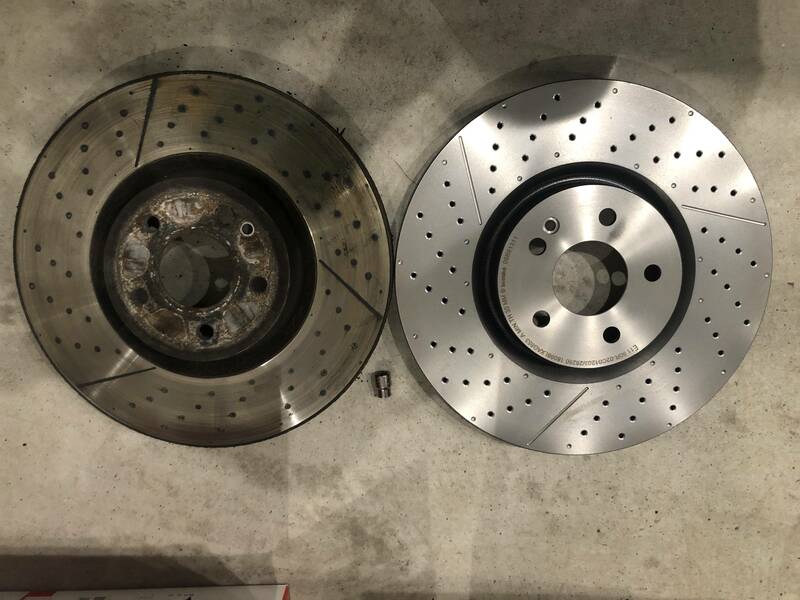 I got my rotors and pads from blue star auto (owner is a friend). 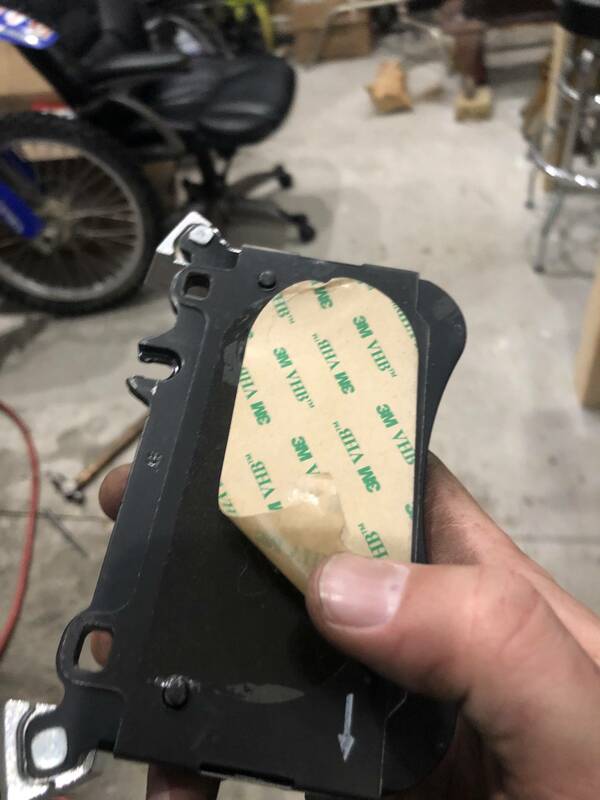 Can’t comment one way or another on using ceramic pads. total cost was around $800 if memory serves.